We love a dockside party. There is nothing nicer than a mid-Summer party at the dock, while watching the sun go down. What says “Muskoka” more than a group of friends, family and neighbours gathered by the lake, with the smell of smoke wafting from the BBQ and the sun turning everything a perfect shade of gold? Here are five ways you can make your dockside parties memorable, while also making it easy to host them again and again. A delicate blend of casual and traditional is the sweet spot for a dockside party. The casual touches come through things like the tablecloth (red-checked is a great casual look), and items like lanterns, to complement the overall look work well. For tableware, a more traditional approach works well. Use real plates –I am a big believer in real china – and real cutlery. This may mean lugging things up and down the hill between your cottage and dock. But it’s worth it. Make it easier with a great tray, or basket with handles. Add cloth napkins to round-out the look. Dishwasher safe wine glasses are also a practical and safe way to go. Nothing worse than broken glass by the lakeside. Freshly-cut flower arrangements from your garden, the forest, or the Rosseau General Store, are a wonderful addition. The Rosseau General Store across the road from us gets fresh flowers delivered every Thursday, perfectly timed for a weekend gathering. Waterfront spaces need to be adaptable for other uses. We rely on portable furnishings to make set-up a breeze. A foldable table, ideally stored in the boathouse, can work well for food items. Movable benches offer adaptable seating that will save you sweating seating plans. We have added one permanent feature, which is a built-in counter in our boathouse. Look around your space to see where you might be able to add permanent upgrades. We can help! Offering your guests a glass of punch as they arrive is a great way to welcome them, while also setting the tone for a fun, relaxed party. One of our sons loves to make a dockside punch or sangria, and there are lots of great recipes out there, you just need to be creative, and taste as you go. Peach is my favourite this time of the year, and it is always a huge hit. A potluck can help take the stress off hosts and can be a bit tricky planning a meal not knowing what everyone will bring. So, we ask guests to bring a salad (“BYOS”) and we take care of the rest. This allows your guests to contribute to the meal, and it adds variety. We create a shaded space for everyone to put their salads, which often makes for a beautiful (and delicious!) display. This variety of salads also means guests can satisfy their dietary needs. Cocktail parties are fun, and normally short. If you like to spend time with your friends, make it a meal so you have more time together. The meal need not be complicated. Burgers or chicken, salads, dessert. Beer can chickens on the BBQ are a favourite. You can put a bunch of them on the grill and feed the masses without breaking a sweat. Catering is, of course, also an option, especially if, say, you are arriving at the cottage Friday evening ahead of hosting a Saturday party. Following these five tips will help you host an unforgettable dockside party. 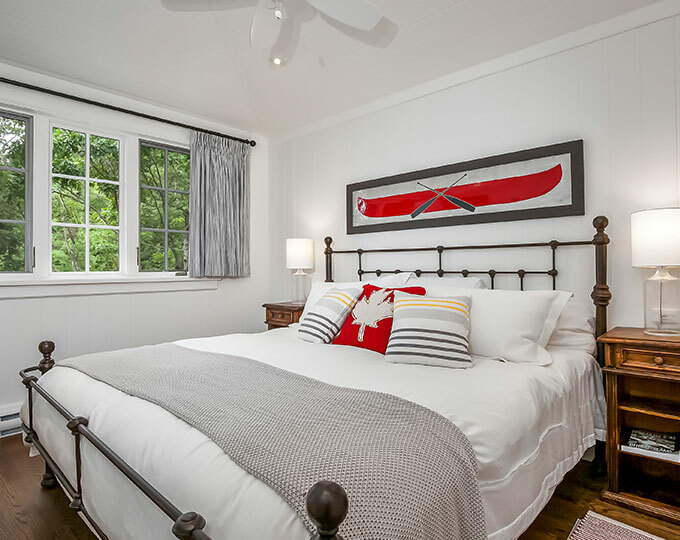 When it comes to decor and furnishings, consider having a dockside party kit that you store in the boathouse or cottage, so your essentials are close at-hand. Whether it is buying decor or furnishings, or offering planning advice, we’re here to help. We have a wide array of serviettes, candles, tablecloths and outdoor furniture here in the store. We can also do a walk-through of the space with you to develop a plan for unforgettable gatherings. When you see us, just ask anyone of us, and we will be eager to share more ideas and tips from our many years of hosting dockside parties!